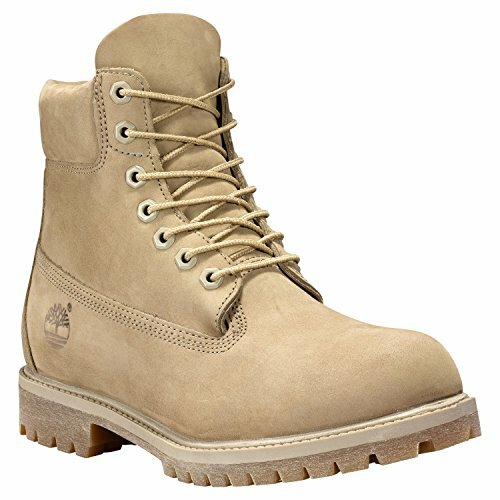 Create the outdoor look you love with the rugged 6" Premium Monochrome Boot by Timberland®. Premium waterproof leather upper with direct-attach seam-sealed waterproof construction. Lace-up closure. Padded collar provides a comfortable fit around the ankle. Rustproof hardware. Footbed and shaft are lined with soft leather; toe box and forefoot are lined with moisture-wicking, breathable fabric. Direct-inject polyurethane outsole for traction and durability. Imported. Measurements: Weight: 2 lbs 15 oz Shaft: 6 in Product measurements were taken using size 11, width D - Medium. Please note that measurements may vary by size. Create the outdoor look you love with the rugged 6" Premium Monochrome Boot by Timberland®. Premium waterproof leather upper with direct-attach seam-sealed waterproof construction. Padded collar provides a comfortable fit around the ankle. Rustproof hardware. Footbed and shaft are lined with soft leather; toe box and forefoot are lined with moisture-wicking, breathable fabric. Direct-inject polyurethane outsole for traction and durability. Imported. Measurements: Weight: 2 lbs 15 oz Shaft: 6 in Product measurements were taken using size 11, width D - Medium. Please note that measurements may vary by size.